Life in the Village (Washington, DC): Guess what's coming to Ft Davis Shopping Center??? Guess what's coming to Ft Davis Shopping Center??? At the ANC 7B meeting this evening, Chris LoPiano from City Interests announced that Fort Davis Shopping Center has a new tenant. Construction on the interior of the space will begin in March. The new tenant will move in around Late-Spring. I know you are all excited and I'm dragging out the announcement.... hehe. I need to build suspense. If you recall back in June, the Fairfax Village community sent me ideas for things they want to see at Fort Davis Shopping Center and things they do NOT want to see. That list was provided to City Interests.... and.... without further ado, please give a warm Ward 7 welcome to.... our newest business..... (okay... 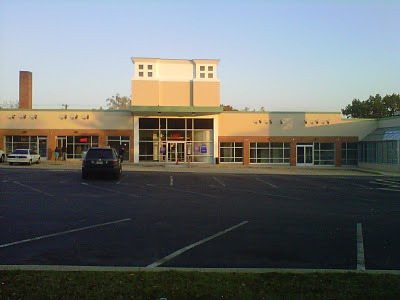 I'm going to spit it out).... FlexCare, which is going to be a community pharmacy located at 3857 Alabama Ave SE. Vivan Ayuk, the owner, talked to the community about the products and services they are going to provide. FlexCare will offer prescription and over-the-counter medicines, flu shots, medical equipment (such as crutches, walkers, wheelchairs), greeting cards, and limited inventory of beauty aids. In addition they will provide personalized services such as counseling on all prescriptions, wellness screenings (hypertension, diabetes, cholesterol), emergency after hour prescription services, free delivery, and others. Ms. Ayuk assured the community that her prices would be competitive with CVS and other pharmacies in the area. Ms V is welcoming Flexcare with open arms. I look forward to walking across the street to fill a prescription and purchase over-the-counter medicines. Any thoughts on bringing a restaurant? The community expressed the desire for a sitdown restaurant. City Interests stated they are going to a retailers conference in the upcoming weeks and hope to woo one. What about a gym/exercise facility? And chance City Interests is looking into that? What Good Location front restaurant I like it. but can it has a Shopping and fitness zone?